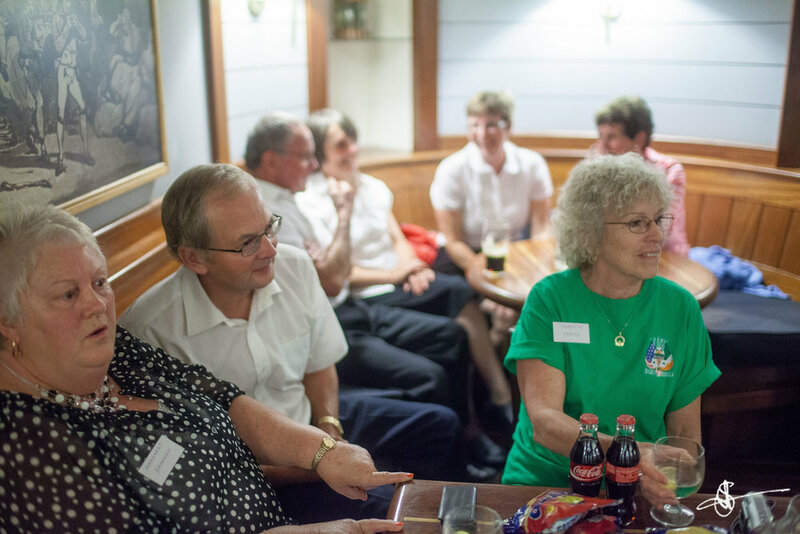 On the evening of September 16th, Crowleys from around the world walked in the front door of J.J. Crowley's Pub in Bantry, Cork, Ireland, and the Crowley Gathering began. The weather outside was windy and rainy, but the atmosphere in J.J's back room was warmer than a summer day in Australia. And there were Australians there who could testify to that! J.J. out did himself in generosity with platters of fruit and cheese and glasses of red or white wine for his international and local cousins. Irish dancers entertained with traditional dances, and Crowleys were encouraged to join in. Everyone managed to be awake and prepared to board three of Martin Crowley's coaches in the morning for a ride through the countryside to tour historical sites. It was a "soft' morning, but Crowleys were dressed for the weather with raincoats and umbrellas. 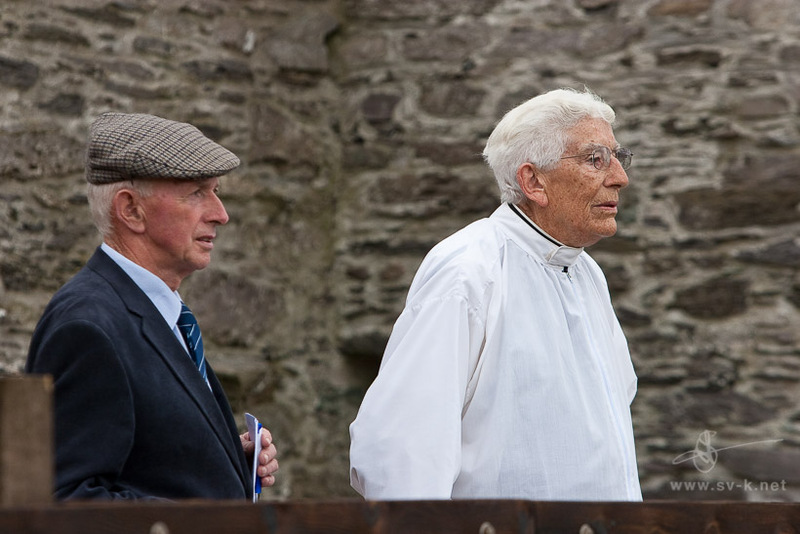 Taoiseach Michael-Patrick Crowley drew from his extensive knowledge of the history of Ireland to explain how the Crowleys came to County Cork and what were the advantages of a round fort. The rain paused long enough for Crowleys to make a thorough inspection of their one-time ancestral homes and to admire the lovely Irish scenery. 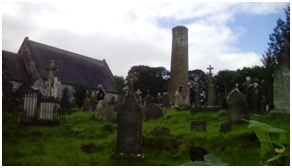 The group also toured the graveyard and round tower at Kinneigh. After a pub lunch, Crowleys continued on to Ahakeera for an outdoor Mass on the site of the Crowley castle. After Mass, the Crowley Clan Council stopped by the Ahakeera Community Center and made a €150 donation. The traditional Crowley Clan Banquet was held Saturday evening at the Maritime Hotel in Bantry. The Banquet is always a time of camaraderie and celebration for the clan. This year was no exception. 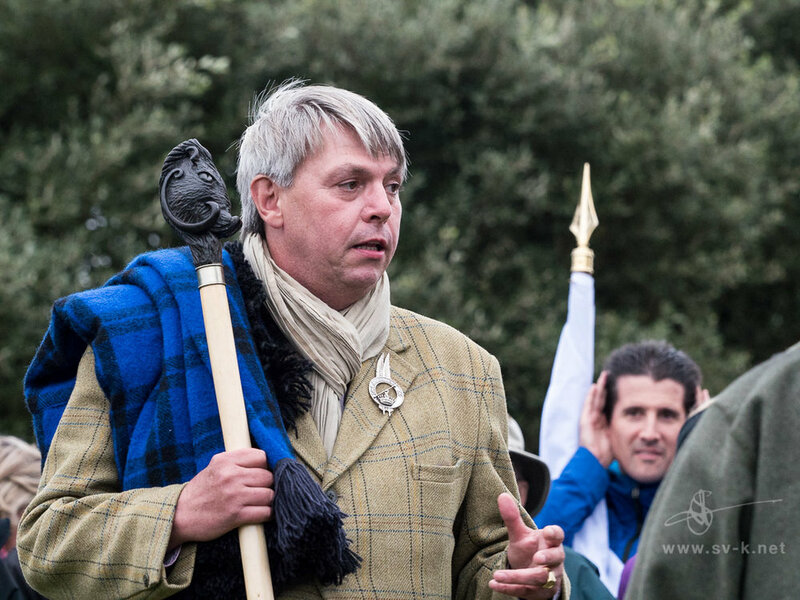 Attendees were encouraged to wear traditional Gaelic dress, and a number of Crowleys arrived in kilts and Munster plaid scarves. The Maritime Hotel outdid itself in the culinary department. Keynote speakers were Kevin Vickers, the Canadian Ambassador to Ireland, and An tUas Gearóid Ó Ceallaigh, Chairperson of the Clans of Ireland. 2016 Crowley Clan Gathering in Bantry. Larry Crowley singing. Sunday's field trip began with a bus ride to the Beara Peninsula known for its wildly beautiful scenery. Once again the day dawned windy and rainy. And, once again the Crowleys were up for the challenge. First there was a tour of Kilcatherine Graveyard followed by lunch and a tour of the Copper Mine Museum. The final stop was at the ruins of the O'Sullivan castle at Dunboy. This dramatic scene was the backdrop for the changing of the Crowley Clan Taoiseach. After three successful years, Michael-Patrick Crowley of Paris handed over the title of Taoiseach to Patrick Crowley, MD of Kilkenny. On Sunday, September 15th, the Crowley Clan returned to its ancestral home in County Cork! 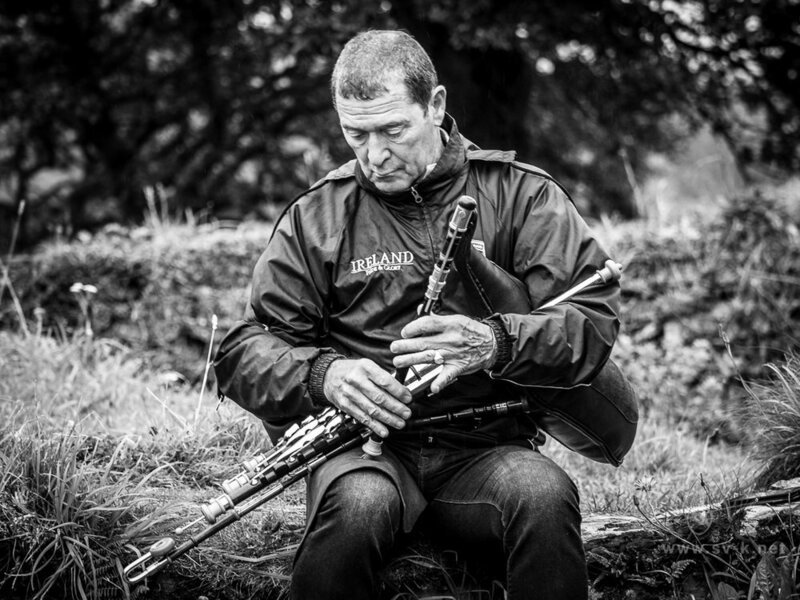 As the piper began playing, Taoiseach Jerry Crowley and Tanaiste Michael Patrick Crowley lead about 80 Crowleys down the lane and through the pasture to the site of the ruins of O'Crowley's Castle. Crowleys had traveled from Canada, Europe, and the United States. As the group began the walk down to the castle, the skies were overcast and the wind was blowing. There were umbrellas and raincoats, but the weather didn't dampen the spirit of the Crowleys, some of whom were seeing the castle for the first time. During the next hour, patches of blue sky did appear, but during the Mass, the wind picked up and the rain fell. Father Liam Crowley from County Cork and Father Joseph Crowley from Connecticut co-celebrated the Mass. Most appropriately, the gospel was the parable of the prodigal son. The group was lead in song by Larry Crowley (Father Liam's brother) who played his banjo and sang. Songs included Amazing Grace and Mary We Crown Thee with Flowers Today. Phillip Crowley from the United States and Timothy Crowley from Ireland gave the readings. 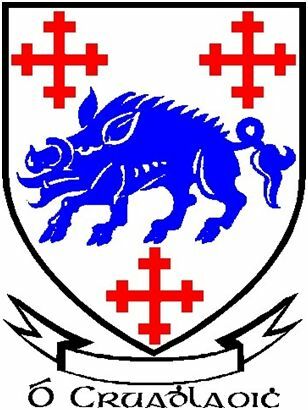 The transfer of the Crowley Clan chain of office happened directly after the Mass. Taoiseach Jerry Crowley took off the chain and put it around the neck of Michael Patrick Crowley who will lead the clan for the next three years. After the Mass group photos were taken, and during the entire time at the castle, a video tape was made. A video was made of the entire weekend and is available for sale. When everyone came back up the hill to the buses, driven by Martin and Liam Crowley, the group continued on to Jerry Crowleys pub at Crossmahon. There hot soup and brown bread were served, and the Irish Road Bowling competition began. 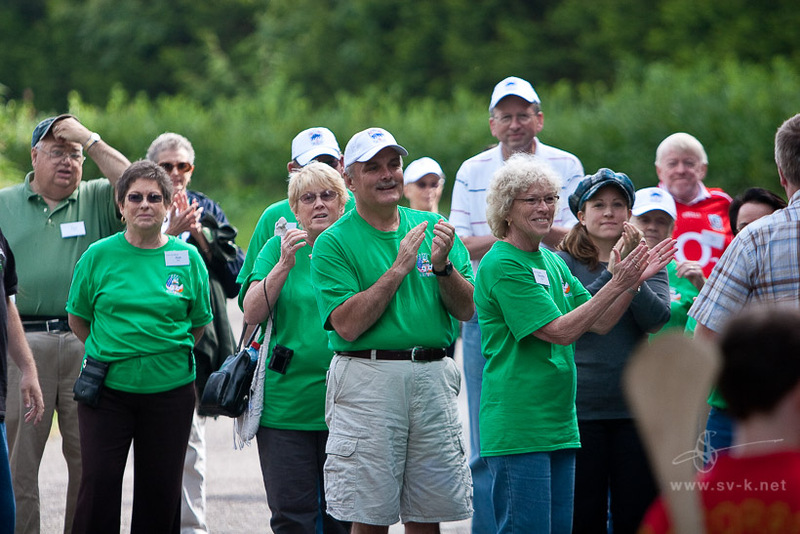 After a demonstration of the sport, three teams were formed, Canadian, American and European. No one proved to be a true championship bowler, but the European team did advance the ball the farthest and won the competition. The evening concluded with a steak barbecue and singing lead by Larry Crowley. Banners with the Crowley Crest hung over the main entrance to Acton's Hotel on the waterfront in Kinsale, and registration for the Crowley Clan Gathering begin at 2PM in the lobby. Ann, Noirin, and Deirdre Crowley skillfully managed the tables, registered participants, collected fees, gave out information, and welcomed Crowley family members from Canada, England, Ireland, France, New Zealand, the United States, and Wales. Next to the registration tables sat Terry Crowley selling Crowley Castle "bricks". These were lovely certificates Terry had made, and for a donation of €5 per "brick" the donor could contribute to the castle restoration fund and receive a certificate. Terry optimistically had 96 certificates printed. He sold all for a total of 236 "bricks", and he turned over €1,180 to Castle Restoration fund! The wine and cheese reception was held at Acton's that evening. J.J. Crowley's Pub in Bantry donated the wine, while the Bandon Dairy Co-op donated the cheese. Gathering participants had a chance to meet each other, to socialize, and to hear the comments of Dr. Damien Bracken, who lectures in Celtic Studies at the University of Cork. Dr. Bracken entertained and enlightened us on the difference between the perception of medieval Irish as being barbarians and the reality of their being an educated and cultured population. For those who could stay awake, the party continued at the Armada Pub. Saturday began with the General Meeting of the Crowley Clan. The first order of business was for everyone to stand and observe a moment of silence in memory of those you died on September 11, 2001. Our DNA Coordinator, Catherine Crowley Budd, spoke of the successes that some of our participants have had finding family connections. She also encouraged male Crowleys who have not joined the project to do so. Seamus Crowley, the Crowley Clan Historian, spoke about the history of the clan from its origins in Roscommon, to its relocation in Cork, and on to the present time. 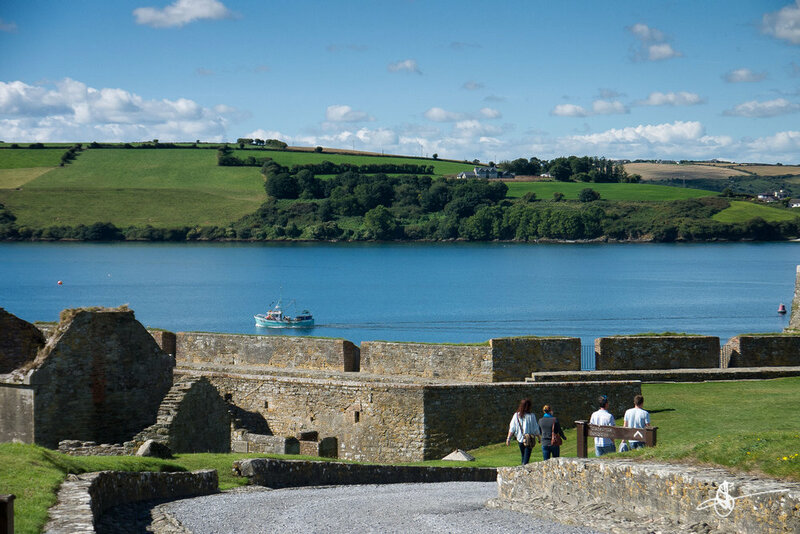 After a break for lunch, Crowleys met across the street from Acton's on the waterfront for walking tours of the old town of Kinsale with tour leader Dermot Ryan, and water tours of the harbor which enabled us to view the remains of two historic forts, James Fort and Charles Fort. Our Crowley Clan Banquet was held that evening in the ballroom at Acton's Hotel with 140 people in attendance. The banquet staff at Acton's outdid themselves with a delicious meal and great service. After the meal, Dr. Patrick Crowley from Kilkenny spoke about the contributions of the Clare County Crowleys. Next, Brian Crowley, Member of the European Parliament, from Cork City spoke on the need to be positive in these negative times. Brian quoted from the Bible, "This too shall pass." The evening concluded with music and Irish dancing. Sunday began with the Irish sport of road bowling on a quiet road near Innishannon. The Kinsale Bowling Club gave a demonstration of the sport, and then we had a chance to try our hands at it. We formed four teams, and then narrowed it down to two. Anyone who has ever been to one of our road bowling contests will not be surprised to hear that the Canadian team won (as usual). After lunch, we boarded the coaches to travel to Ahakeerna and O'Crowley's Castle. Lead by a bag piper and our flag bearer, Alyssa Crowley, we marched down the lane to Mass at the castle ruins. Father O'Brien from Bantry was the celebrant, Johnny Crowley, also from Bantry, was the server, and Tom Crowley from Ohio was the reader. At the end of the Mass, just before the final blessing, Jerry Crowley from Bandon received the chain of office and became the new Crowley Clan Taoiseach. We joined hands and sang Auld Lang Syne. As we began our walk back up the lane to the coaches, a soft rain began to fall. Our weekend was over. “I think I’m lost,” said the American on his way to the Crowley Clan Gathering to the store clerk somewhere north of Clonakilty. “Well, you’re still in Ireland,” answered the clerk. Failte: From the lush, rolling hills to the breath-taking coastline, we were, indeed, “still in Ireland” as some 200+ Crowleys from all over the world gathered at the Quality Hotel in Clonakilty for the 2007 Gathering. Taoiseach Liam Crowley welcomed one and all Friday afternoon, September 14. A cheese and wine reception, courtesy of J. J. Crowley of Bantry, was held later that evening, and we were again welcomed, this time by the Lord Mayor of Clonakilty. Never a family to pass up a chance to sing along to great Irish music, we then piled into two buses, provided by Martin Crowley, and found our way to Jer Crowley’s pub, Crossmahon, in nearby Bandon. There we were privileged to listen to Larry Crowley’s banjo and Chrissy Crowley, 16, who came all the way from Nova Scotia to serenade us with her outstanding fiddle playing. Taking Care of Business: You would think all of that reveling would have exhausted us, but not so! Saturday morning over 100 cousins showed up at 10:30am for a general meeting of the Crowley Clan. Seamus Crowley gave us a brief history of our ancestors, dating back to the 1500s. Cathy Budd brought us up to date on the DNA project, an exciting way to trace how close our relationships are. A discussion was held regarding the progress made in restoring the Crowley Castle, and there was general consensus that this important effort must continue to move forward. Judging by the questions and comments, there is no doubt that the Crowleys are a pretty intelligent clan. History Revisited: Speaking of history and the Irish, we broadened our knowledge Saturday afternoon when we visited Michael Collins’s birthplace and heard an excellent speaker, Tim Crowley, tell us about the life and untimely death of this Irish hero. The next stop was the Lis Na gCon ringfort, where John Kehoe, dressed in apparel reflecting the 1200s, told us about this historic site. Brave souls (a clan trait) crawled through the pitch-dark cave, known as a souterrain, there. The Banquet: Saturday’s banquet, held at the Quality Hotel, saw a gathering of over 200 cousins from Ireland, the U.S., Canada, New Zealand, Wales, France, Australia, and England. We were honored by the presence of Brian Crowley, Member of the European Parliament, who spoke about the importance of our history and heritage. The chain of office was passed from Liam Crowley to Marian Crowley Chamberlain, who is our Taoiseach for 2007-2010. Jer Crowley is the new Taniste. A raffle was held, funds to benefit the castle restoration. Tom Crowley of Arizona and Ohio won the first prize, a painting of the Crowley Castle done by artist Deirdre Crowley. Tom then graciously presented the painting to Council member Anne Crowley, ensuring that it stay in Ireland. Afterwards we enjoyed dancing and camaraderie well into the wee hours. At some point after midnight, MEP Brian Crowley introduced American Marc Lascko, who had just asked Tom Crowley (Taoiseach, 2001-2004) for permission to marry his daughter. Marc stepped to the bandstand and proposed to Kate Crowley, daughter of Tom and Mary Lynn. Kate said Yes…and she has plenty of Crowley witnesses to back her up. 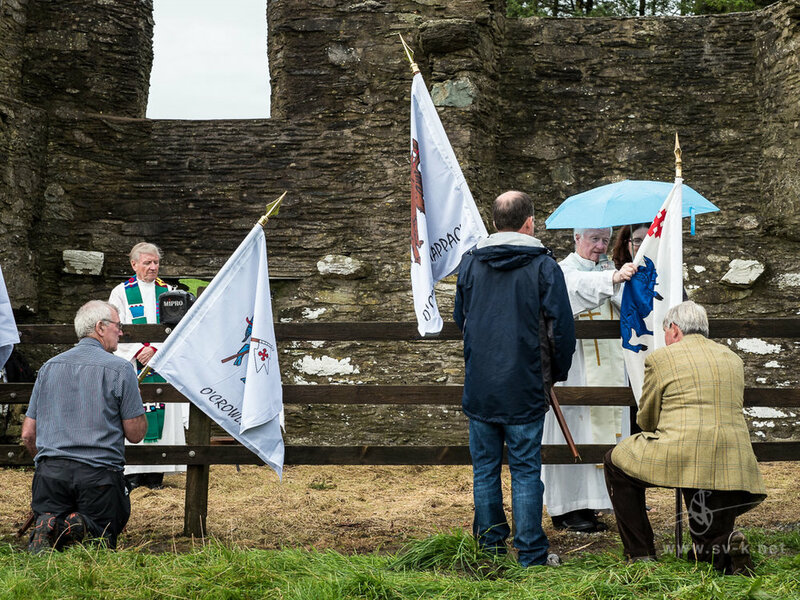 Mass at Crowley Castle: The weekend was capped by the moving event of Mass at Crowley Castle, perhaps the first Mass ever held there (or at least in the past 500 years or so.) American Paul Buckley, in Ireland on an internship, carried the Crowley standard down the hill and into the field, followed by his Crowley cousins. Father Liam Crowley officiated, with Johnny Crowley as acolyte. Music was provided by a local choir as well as fiddlers Chrissy Crowley and Lisa Butchert. Many prayers and hymns were in Irish, beautiful and haunting to hear against the backdrop of the castle. We marveled at the improvements so far, done by stonemason Robert Rohu of Waterfall, County Cork. As Mass ended, we left the field to the music of a small girl, Anna Flynn, playing her tin whistle as the sun set behind her. It was a glorious weekend! 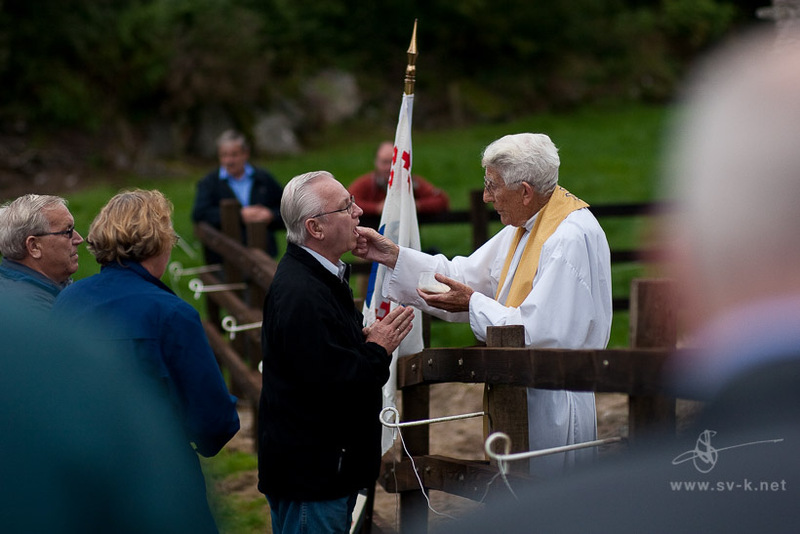 From an opening wine and cheese party on 3 Sep to welcome the Clan, through a gala banquet at the Westlodge Hotel, to the closing Mass celebrated at the Mass Rock at Beach, the 2004 Clan Gathering brought together more than 200 guests from around the world for a festival of comraderie, Clan tradition and local history. Professional photographer and honorary Crowley Todd Parker is pleased to report that his photo CD of the Crowley Clan gathering is now available to purchase. The CD contains 300 plus images, culled from over 600 photos Todd shot during the three day event. Total cost of the CD is $30, including shipping. Todd has graciously offered to donate $10 from each CD to the Crowley Castle Fund. A few of those final images are currently available for viewing on his website, www.toddparker.com. Individual prints can also be purchased. Orders and enquiries should be directed to Todd by email at todd@toddparker.com. Many of us came as first-timers and strangers to each other. We left three days later as friends and family. The opening wine-and-cheese reception, courtesy of local pub owner J. J. Crowley, broke the ice nicely in a casual atmosphere and allowed us all an hour or so to get briefly acquainted with as many people as possible. Over the next few days we would have many opportunities to get to know them well. 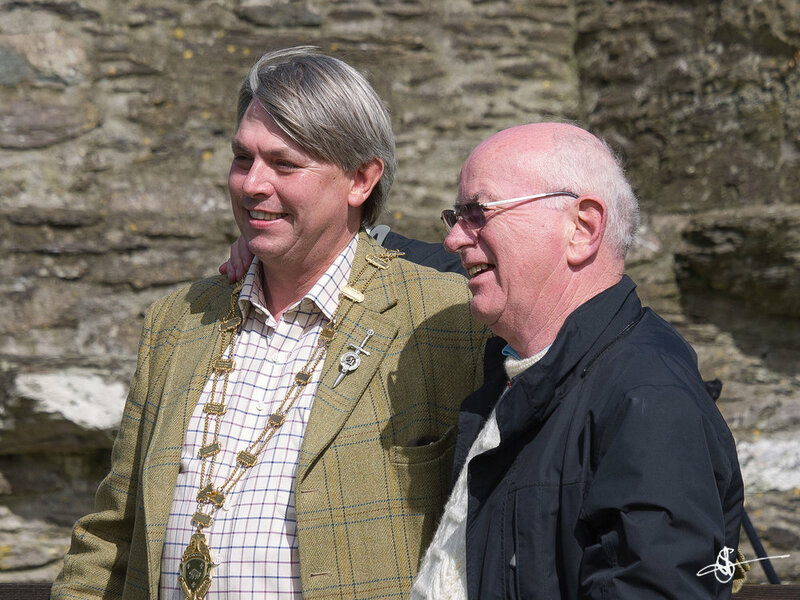 Welcomes were extended in person by Pat Bono Kelly, the Mayor of Bantry, and Paddy Sheehan, Mayor of Cork County. The nametags were extremely valuable and helpful, although by the third day, we knew so many people, we almost didn't need them. Some other "Crowley Attire" seen included sun visors, tee shirts, and the wildly popular Crowley Crest pins generously handed out to many by Terry Crowley of Ontario, Canada. Two nights of sing-alongs at J. J. Crowley's pub were enormous fun, with great music, great singing, great pints, and much hand clapping and foot stomping. Although not scheduled especially for us, the Bantry Fair (market day) and the Bantry Agricultural Show occurred the same weekend and were fun and interesting diversions. 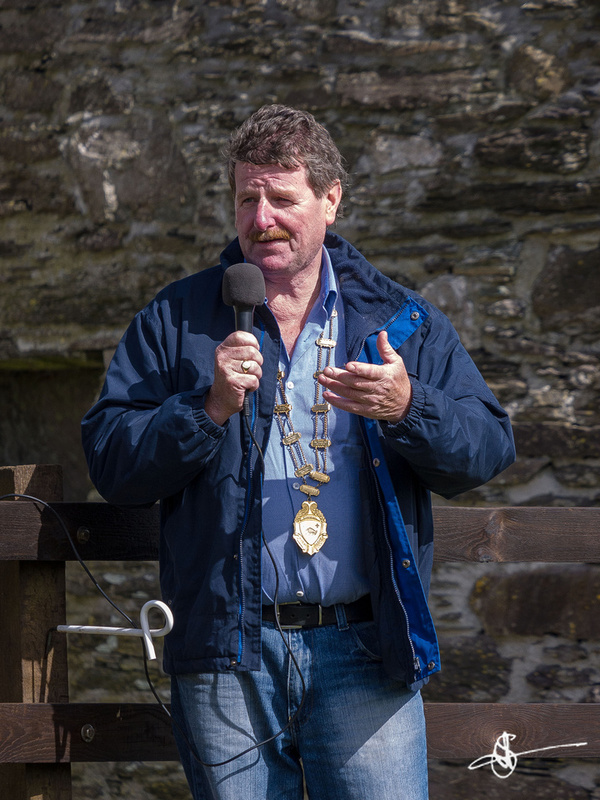 • Cariganass Castle, an O'Sullivan Castle undergoing restoration-- An inspiring talk on the history of the site and the restoration experience was given by Dan O'Sullivan, with many helpful suggestions about how the Crowleys can go about saving and restoring our own castle. Live, outdoor music on the "squeeze box" was provided by Johnny Crowley and Vincent Crowley. In the spirit (literally) of truce between the O'Sullivans and the O'Crowleys, a bracing drink was served to all within the castle walls. It wasn't poteen, but it had its own little kick. • Gougane Barra, ancient and lovely site of St. Finnbarr's first monastery-- The Crowleys were able to "attend," or at least observe from afar, the two weddings that occurred in a tiny but beautiful chapel on the grounds while we were there. An informative presentation about Gougane Barra and St. Finnbarr's monastery was offered. • Crowley Castle remains at Ahakeera-- It was incredibly moving and impressive to stand with others of our lineage on these ancient Crowley grounds and proudly watch our standard being borne down the hill to the site. We were transported back in time hearing a mournful hunting horn and seeing a knight in full armor approach the ruins of the Crowley Castle! James and Bill Crowley, brothers from California, demonstrated the armor and fighting equipment of medieval knights, and Michael Patrick Crowley from France demonstrated the ancient horn. Seamus Crowley offered a brief and fascinating history of the castle, and we all came to understand the importance of protecting and maintaining - at the very least - what remains of our family castle. In the evening over 200 Crowleys from around the world gathered to enjoy food, drink, camaraderie, music, and dancing at the banquet. Taoiseach Tom Crowley of the U.S. handed over the chain of office to new Taoiseach Liam Crowley of Ireland. Accepting the appointment to Tanaiste was Marian Crowley Chamberlain of the US, editor of the Crowley Clan Newsletter. Brian Crowley, Member of the European Parliament, offered moving and inspiring comments. Brian underscored the importance of family roots, history, and the salvaging the Crowley Castle remains to ensure an unbroken connection with our past. 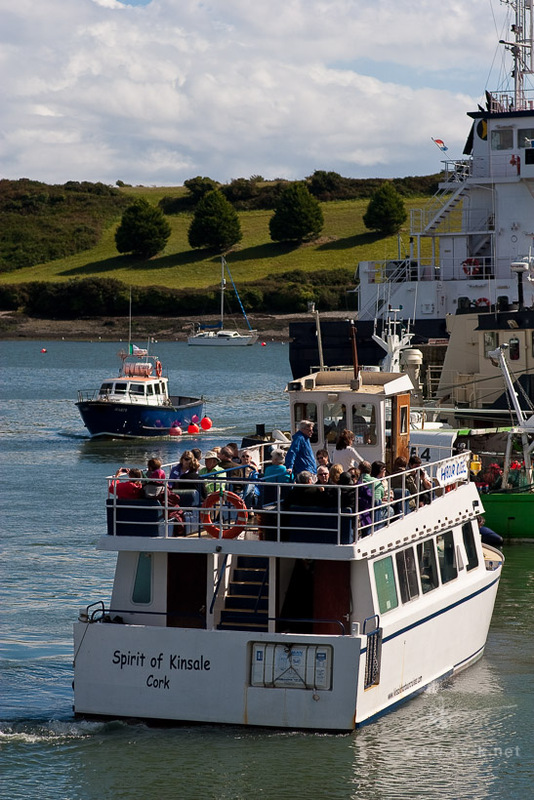 A warm West Cork Failte (welcome) was given to Crowleys from the eight countries represented at the 2001 Crowley Clan Gathering, which took place in Clonakilty, September 21 through 23. Taoiseach Charles Crowley started festivities on Friday afternoon with introductory remarks. The clan was then invited to take "Crowley's Walk", a tour of archaeological replications on the farm of Tim and Delores Crowley, followed by a brief slide presentation on Crowley history. The evening concluded with traditional Irish music and stories from a Seanchai - an Irish storyteller. Saturday started with a bus tour of the Old Head golf course at Kinsale, followed by a visit to a monument dedicated to the survivors of the Lusitania, which was torpedoed off Kinsale in 1915. We then toured the site of the 1601 Battle of Kinsale, the last great battle fought by the Gaelic chieftains. 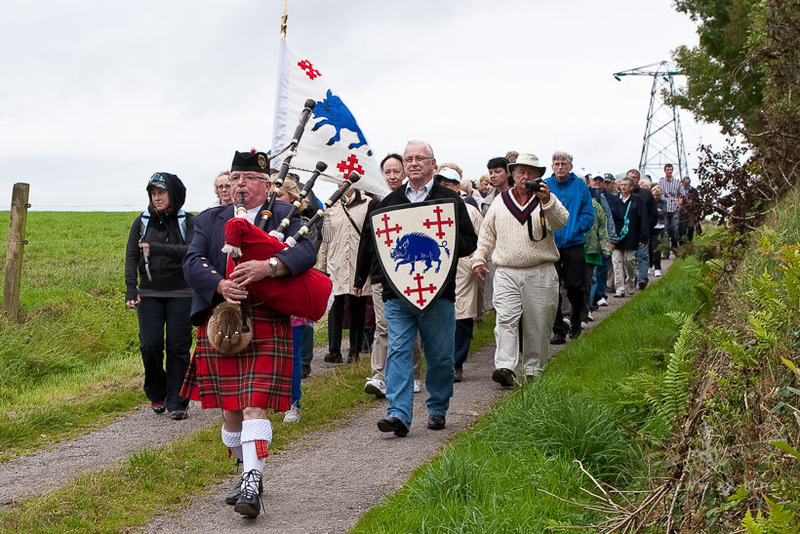 Marching under the Crowley banner, the Clan attended the 400th Anniversary observance of the Battle. 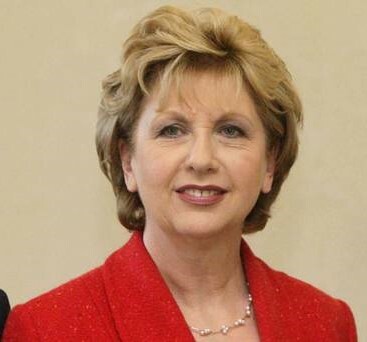 Irish president Mary McAleese gave a moving speech, saying the Battle was a bitter failure for the Irish, a triumph for the British and a grandiose but mistaken gesture by the Spanish. Also attending the ceremony was the Spanish ambassador and Prince Andrew of England. At the evening meal at the Pink Elephant restaurant in Kilbrittain, Michael-Patrick Crowley formally launched his book - The Origins and History of the Crowley Clan. The evening concluded with Irish music (performed by Crowley musicians) and singing at Jerry Crowley's pub. Sunday morning opened with a demonstration of the old sport of road bowling by an All-Ireland champion. We then held a tournament comprised of teams from each country. The USA ultimately prevailed, but the sport will never be the same! 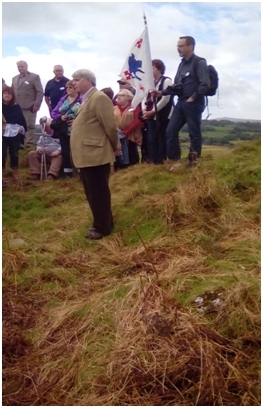 In early afternoon Father Dan Crowley of Boston, celebrated Mass at the Carraig an Aifrinn Mass Rock. Father requested prayers for the deceased members of the Clan, as well as those who had perished in the September 11 tragedy. Back at the hotel, Seamus Crowley gave a brief presentation on Crowley history. 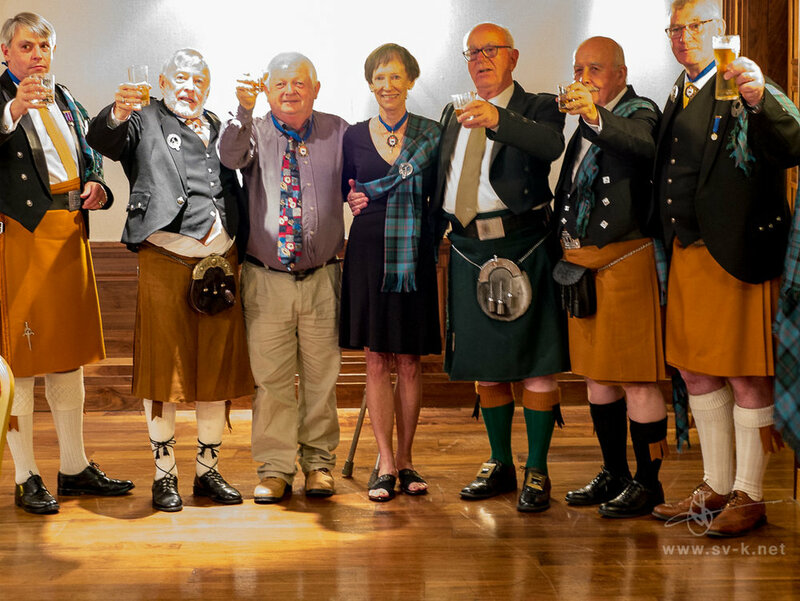 Sunday evening, the Clan concluded a memorable weekend with a banquet at the Inchydowney Lodge. Senator Brian Crowley MEP, (Member European Parliament) eloquently presented the keynote address. Brian reminded the Clan of the challenges presented by the events of September 11 and the necessity of meeting difficulties with prudence. The evening ended with dancing and socializing by all 95 Clan members in attendance. During the banquet, Tom Crowley of Akron, Ohio, USA, was selected as the Taoiseach of the Clan for the next three years. Retiring Taoiseach Charles Crowley presented Tom with the Chain of Office. Liam Crowley, Bandon, County Cork, was selected as the new Tanaiste. They join current members Liam Crowley (Tanaiste) and former Taoisigh Dr. Sean Crowley (1986-1989), John Crowley (1989-1992), Kitty Horgan (1992-1995), Flor Crowley (1995-1998), and Charles Crowley (1998-2001). Also on the committee are Gerry Crowley, Larry Crowley and Anne Crowley.